Gamers who pre-order Shadow Warrior at GOG will get an exclusive katana drawn from the original game. The Escapist recently had the chance to take a peek at Flying Wild Hog's reboot of Shadow Warrior and what we saw left us fairly impressed. It looks bloody, it looks fast-paced and, above all else, it looks fun. 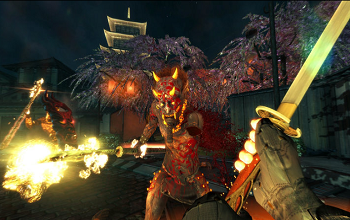 Suffice it to say we wouldn't be sad to have a little more Shadow Warrior in our lives. Lucky for us, GOG and the game's publisher, Devolver Digital, have teamed up to dish out a deal that will do just that. Gamers who pre-order the Shadow Warrior reboot at GOG will find themselves sitting pretty on a complimentary copy of the GOG version of Shadow Warrior Classic. Then again, seeing as you can already get Shadow Warrior for free on Steam, you might want something else to sweeten the deal. That in mind, a GOG pre-order will also net customers an exclusive in-game item, a katana rendered after the one from the original game. The online retailer is also offering a pre-order discount that drops the price of the game to $33.99 (original price $39.99). The fact that the game will, per the retailer's standards, be DRM-free doesn't hurt either. When you get down to it, pre-orders come with an inherent risk. There's no solid way to tell how good a game will be prior to its release. That being the case, pre-orders can come with perks and, as far as we're concerned, a free game is a pretty decent extra. That being the case, if you're among the "wait and see" camp, we'd still recommend you give Shadow Warrior Classic a try. Some elements, like it's blatant political incorrectness, haven't aged the best. That said, it's still fun game and well worth a play through.